What documents should you as the person being sponsored include in the application? Is that all that the person being sponsored is required to include? What is the Importance of all the Sponsorship Documents that are required? Each and every document that you are required to attach to your application has a very distinct purpose. These documents will be the way that the Immigration Officers will be able to confirm: your identity, identify the people in which you would like to come with you as well as allowing them to detect the level of legitimacy when it comes to your relationship. As the Sponsor what Documents are you required to provide and submit? 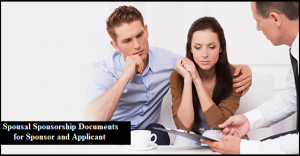 Are those all of the documents that you will have to include in your application to sponsor? Proof of all of your financial obligations that you have- this will include things like your mortgage, taxes, personal lines of credit/loans, alimony payments and insurance payments. Passports that indicate the identity of your parents or childrenIf you have any previous marriages or common-law partnerships that you were involved in that ended before you entered the relationship that you are in with the person whom you would like to Sponsor you must submit proof that they are over.You must also be responsible to show using documents that if you are currently living outside of Canada that you will return once the person you are planning on Sponsoring lands in Canada. If you are living in Quebec then there will be additional forms that will be required of you to fill out and submit in regards to that. If you are not sure about any of the documents or how they are supposed to be completed properly let us help you! Our staff are trained with the ability to look over all the required documents to make sure they are completed and all the supporting documents are included to demonstrate genuineness in the relationship. Should you have any inquiries within this process please call our Immigration Firm and we will help you out in any way possible! Just like you, we want to make sure that you have everything that you need in order for your application to be successful.